The use of touchscreen based mobile devices is prevalent today, with each containing potentially vast amounts of personal data and special access. The security consideration surrounding these devices is the cause of much concern for financial institutions and those involved in the prevention of cybercrime. Online fraud is a serious and expensive problem for all financial and e-commerce institutions. According to the PwC 2018 Global Economic Crime and Fraud Survey, 49% of organizations globally claim they’ve been a victim of fraud and economic crime in the last two years. 31% of respondents that suffered fraud indicated they had experienced cybercrime. With this in mind, finding new ways to learn and recognize the behavior of fraudsters online becomes a topic of great importance. But the uptake of computational devices also brings benefits that can help prevent fraud, such as of expansive sensor data, allowing for new and comprehensive biometric analysis of the user. At Callsign we believe this has huge potential, allowing us to use state-of-the-art machine learning techniques to authenticate users. Through scientific investigation, we’ve proven that mobile device usage is unique to each individual. 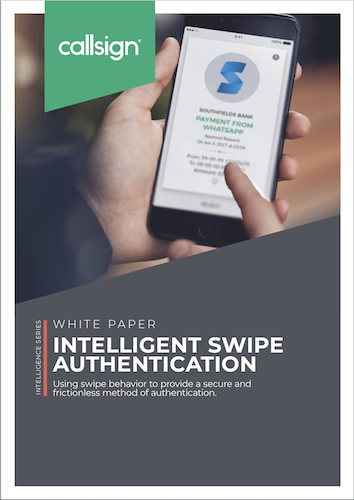 The way that you use your device, and the ergonomic swipe behavior you exhibit whilst making a secure transaction is something an imposter would find near impossible to replicate. We use this knowledge as the basis for our intelligent mobile authentication model.